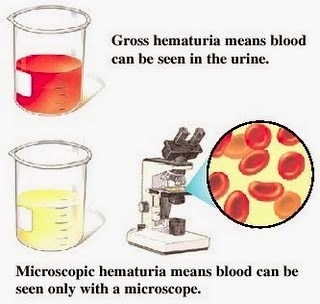 The affliction of having blood in urine, medically known as hematuria is usually not a reason for major alarm. Since underlying medical conditions that cause blood in urine can be serious, it should not be ignored if it does occur. In each case of hematuria, a doctor should evaluate you to test and confirm the underlying cause of hematuria. There is no particular treatment for hematuria since it is only a symptom and not a particular condition itself. Instead, the treatment should focus on treating and improving the underlying cause if it can be determined. In several cases there may not even be a need for treatment. If there is blood in the urine, this is a clear sign. 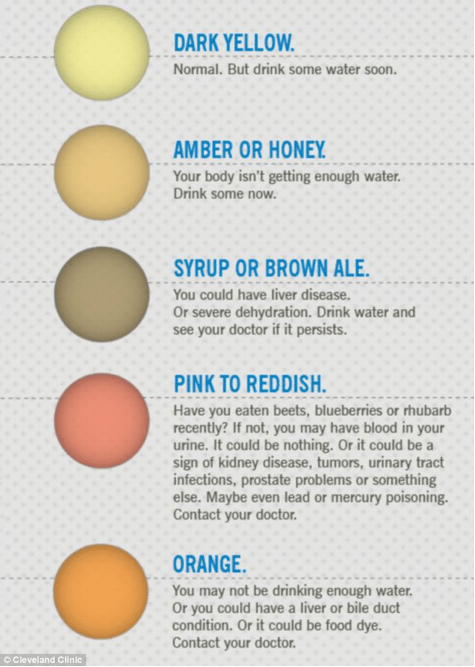 Instead of pale normal yellow color urine, it may be pink, red, brownish-red or tea colored. This is what doctors would call gross hematuria. In some cases, blood is not visible to the naked eye and may be in the presence of red blood cells that can only be detected within the lab. This is considered microscopic hematuria. It is typically only discovered when a urine sample is tested with a dipstick and results are carried in a microphone examination. Bladder infections ( acute cystitis). 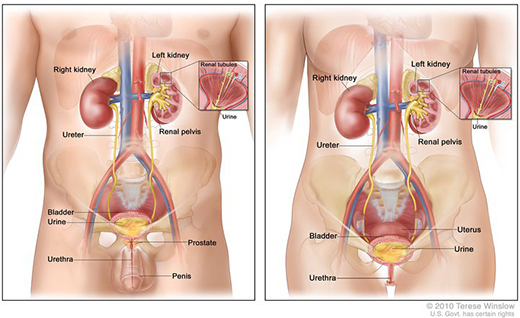 In adults bladder infections normally cause burning and pain during urination. In infants with bladder infections, they are durable, feeding poorly and have a fever. Older children may have a fever, extreme urgency, and pain urinating and lower belly pain. Kidney infections (pyelonephritis) Symptoms may include flank pain, or lower back pain, with chills and fever. Kidney Stones– Symptoms may include severe abdominal or pelvic pain. Kidney Disease, Symptoms include high blood pressure, body swelling, which includes puffiness around the eyes. Certain medications such as penicillin, phenazocine, heparin, cyclophosphamide. Inherited diseases such as cystic kidney diseases and sickle cell anemia. Your physician will begin with a medical history and ask what may have caused the occurrence of blood in your urine. This will be succeeded by a test referred to as a urinalysis. IN this test, a urine sample is analyzed. A urine test may include urine cytology, which uses a microscope to look for abnormal cells in the urine. A blood test may also be ordered. If the blood includes high levels of wastes that kidneys are supposed to remove, it could be a sign of kidney disease. Computed tomography CT scan. A CT, which is a unique X-ray scan, can help identify bladder tumor or kidney stones, and other abnormalities of the bladder, and ureters, kidneys. Kidney ultrasound. An ultrasound uses sounds waves to produce an image of the kidney’s structure. Intravenous pyelogram (IVP) This test is an X-ray of the urinary tract that needs dye. Cystoscopy. This test consists of the insertion of a small tube with a camera into the bladder through the urethra. Tissues samples (biopsy) may be obtained to check for the presence of abnormal or cancerous cells. Kidney (renal) biopsy. A small tissue sample is extracted from the kidney and examined under a microscope for signs of kidney diseases. Treatment is aimed at the underlying cause. After treatment, your physician will recheck your urine to see if the blood is gone. If you still have blood in your urine, you may additional test, or you may be referred to a urologist. Usually, no treatment is needed unless a serious condition is causing the hematuria. If no underlying cause is found throughout the initial evaluation, you may be recommended to have follow-up urine testing and blood pressure observing every three to six months, specifically, if you have risk factors for bladder cancer, such as being 50 or order smoking cigarettes, or exposure to certain industrial chemicals.